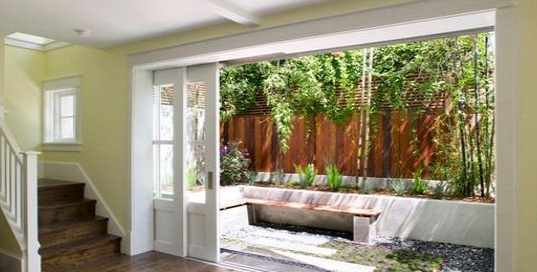 The sliding door or pocket door is a door that is “hidden” behind the wall when you open it. Type of door is more efficient in terms of space optimization. Indeed, if you’re looking for a unique door solutions that do not “consume” much space, the sliding door may be the answer for you. But, be careful, this door also has a negative side. Many people admire this type of door because it can be used in the context of both traditional and modern homes. A little accent can make a simple pocket door into harmony with the surrounding decor. 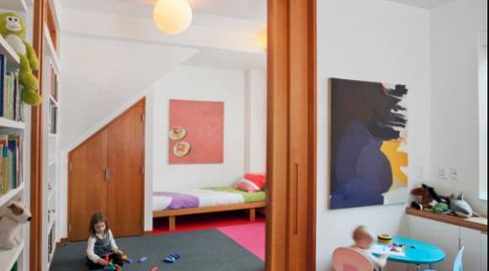 Currently, the sliding doors are an ideal solution for small-sized spaces, such as bathrooms, walk-in-closet, and door to inter-connecting room with the kitchen work space. In essence, this type of door is able to provide a wider space. However, although it match placed in spaces are relatively small, such as in the bathroom, this type of door will also provide open space between the door and the holder. This door holder makes a small amount of air can be in and out. The door is not able to provide cover tightly like a traditional door. In addition, the “pocket door” is also not able to provide acoustic privacy. Therefore, this type of door is suitable for you who want to separate yourself with your child while still watching them play. You can also make small-sized doors which only serves as a “fence” to keep little children and pets do not break into a particular room in the house. By design, this door will appeal with tall and slender form. Unfortunately, the door which is too high will be hard pushed and locked. Doors slim shape is also an issue for your family member who was taller or smaller.